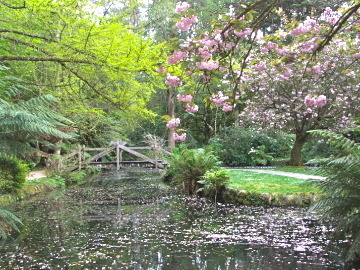 Rather than sticking to the Royal Botanical Gardens, why not head outside of Melbourne and see some beautiful places. This first garden is a secret waiting to really overwhelm you, be careful if you are taking your girlfriend, you'll find yourself dropping to one knee and proposing to her. If you are a her, it's a leap year so you can propose to him, and let me tell you this is the place you could come over all romantic like, and do something you might regret later. If you do propose though, and on the way home you realise it was a mistake, pull over for your fiancé to take a leak, when they get out, just drive off, they'll never find their way home from here. 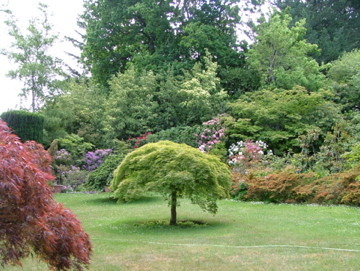 These are wonderful gardens, and would be ideal to take the whole family, old and young. I'm not going to waffle on too much about the flowers (I'm not Burke's Backyard), I'll let the pictures do the talking. If you ever saw the original, black and white movie the 'Secret Garden' it is full of bitterness, but once in the secret garden it is full of hope and colour. This is what your life feels like when you step into Forest Glade Garden. For those of you who love flowers, there are tulips, azaleas, rhododendrons and a variety of exotic as well as rare plants. At the height of summer, there are glorious hydrangeas, a vast array of perennials, green lawns and the fresh air of the fern gully. In autumn, maples, birches, beeches and other exotic trees snuggle amongst the tree ferns along Willimigongon Creek. The gardens are popular with bus tour groups. The operators find the garden ideal with relatively level walking for older folk on tour (unlike Alfred Nicholas Memorial Gardens, you'll need climbing gear there). If you would like to organise a bus give the gardens a call for further information. If you do make the mistake of proposing, you may as well go the whole hog, and get married here too. 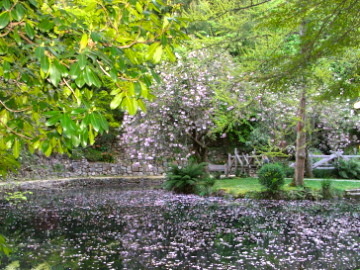 The gardens are popular for weddings, which can be held by arrangement. For further information and bookings give them another call. Forest Glade is open to the public September to May, 7 days a week, from 10:00am to 4:30pm. Entry is $8 for adults, the proceeds of which goes to their charitable foundation. Children are admitted free. You can take a virtual tour of the garden here, with 360º views of each photo. I read an article in the Age once and it said the Dandenongs are the only place that come close to competing with the garden's at Mount Macedon. Make a day of it, you won't be disappointed. If you are coming from Melbourne, head north-west along the Calder Highway, turn right into Mt Macedon Rd just past the Gisborne exit. This is really a double header of garden visits, as this one is literally just over the other side of the road from Forest Glade. I'm going to skip the periphrastic meandering, I don't want this to come across as bloated prose. 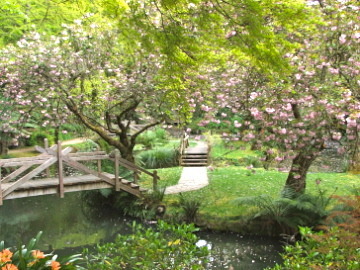 The garden covers 7 hectares of heaven. As each season passes this garden transforms into a new guise. Pleasure is waiting for you in 'Tieve Tara' if you love the serene, tranquil peace of a beautiful garden. Hey, that's periphrastic. The garden is open from the end of March until the start of May then mid October through until the end of November. You can watch a video of the garden on the ABC gardening site. Scroll down and you'll find the Tieve Tara link. This gives you a good idea of what you are missing and a chance to hear what the owner has to say. Some people are fundamentally good, this woman I suspect, is one of them. I believe there are a lot more gardens up here in the Macedon area, but they aren't open on a regular basis like these two are. Nearby at Duneira there is another garden to visit. To book a garden tour call 5426 1490 or go to the website. I should have mentioned you can get the train to Macedon on the Bendigo line, so you could probably have a day out by train, but, there'll be a bit of walking involved with this option. This is not a garden, but if like me, part of a nice Sunday drive is to see the sights, have a walk through some lovely garden. Then to cap it off, have a light lunch, or afternoon tea. Then you will know where I'm coming from. If you're thinking you've been short changed, don't worry I've got a few surprises up my sleeve, later on, this writing device also means I might keep your interest until the end of this article. Check out the Macedon Rages tourism website to find some great accommodation options in the area. Top of the Range, is right on the top of the mountain, I usually break out into "The Hills are alive" up here, this is a recording my partner candidly caught of me, my pants were too tight that day. We went for a walk after our scones and tea (which are great here, the jam is great too) to look at the Memorial Cross that commemorates our war fallen. This is a nice little walk through a gardened pathway and you get to see a great view from the peak at the top. Well that's the end of your trip to Mount Macedon for now, we are heading to my other favourite place, the Dandenongs. 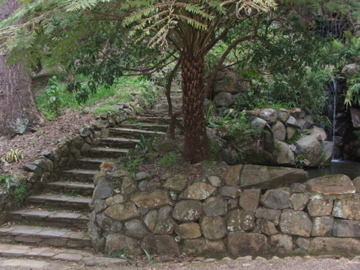 The Alfred Nicholas Memorial Gardens has a maze of paths that are shaded by massive mountain ash trees. As you make your way down you can wait with baited breath for the treat at the bottom, this of course is while you are enjoying the multitudes of hydrangeas, as you come to a Gazebo with some strange sculptures that look like something alien to this place. Once you near the bottom, you'll start to see glimpses of the beauty to come. Waterfalls and an ornamental lake complete with a little boathouse. This is an ideal spot for a picnic, but travel light as it is a haul to get back out of here, you'll see the skeletal remains of some previous picnickers who just didn't have the energy to get back up. In spring, you can view the flowering azaleas, cherry trees and viburnum, this as you can see from my photos, is when we went. We've been here several times prior to this, I went with my partner and her olds. They were down from the bush, we thought it would be something nice to see. It's a memory that becomes one you'll keep and cherish. You'll find it's lovely when ever you choose to go. As you can imagine Autumn is particularly lovely. There is also some colourful birdlife. When we were there I saw what I assume was humming bird. It was small with a long curved beak, it's wings, fluttered quickly, whilst the bird was virtually stationary. I couldn't get my camera on quick enough, before he flew away. Alfred Nicholas purchased this land in 1929 and built his home on it, he then bought up the surrounding land to add to his estate. Alfred Nicholas and brother George developed the 'Aspro' tablet originally a German discovery. Supply dried up due to the first world war. George, a chemist, then had to re-develop the drug, He was awarded patent by the Australian Government. Alfred Nicholas searched the streets of Melbourne for established trees to complete his garden. He sadly died before he realized his dream. The property began to decline. Mrs Nicholas remained there until the start of the second world war. The house was converted to a laboratory when the war ended. The Nicholas Company donated the gardens to the people of Victoria in 1965 through the local shire council. The property was acquired by Parks Victoria in 1972. Admission is $6.90 for adults - $5.30 concession - children under 10 free. Visitors are asked to place their entry fees in a small box just inside the main gate. I got some conflicting information here, on the parks and gardens site it says entry is free. From my recollection there is a donation box. I hope you enjoy these gardens. I have been to a few others up in the Dandenongs, but I can't remember the names, and I can't find the photos. But these are the best ones I've been to. Well you've got to number five and you may find other gardens you like. If you do let us know. This isn't technically one garden, but many that open up to the public throughout the year. If you head to the Open Garden website you can find all the information you could possibly need, including dates of openings, times, costs, and pictures. If you'd like to get an app that has all the information on this list plus more for iPod, iPhone and iPad, requires iOS 4.3 or later, you can get it here for about $10.00. If you are going interstate, or you have friends traveling around Australia, this may be a handy resource. You may just like to peruse the garden's or get some ideas for your own garden. Dame Elisabeth Murdoch's beautiful garden. Located at Langwarrin VIC. A delightful mix of old and new. 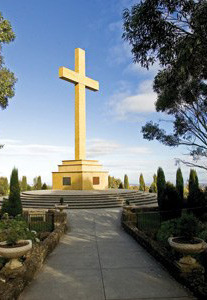 Located at Thornton VIC. One of Australia's most intact Edna Walling designed gardens. Located near Crookwell NSW. Lush tropical foliage garden at Seven Hills, NSW. Visit one of our most spectacular gardens. An enchanting rainforest in Bayview, Sydney. A classic Mount Wilson garden, NSW. Stunning native garden at Camden, NSW. Wonderful garden at Birkdale, QLD.